Dog & 3 Puppies – ADOPTED! Hello, due to family emergency back home, a family has to return to US on this Thursday, July 11th. 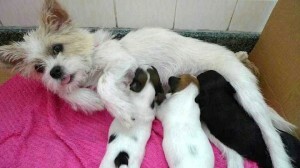 They have a dog with her 3 puppies (born on June 20th) whom they could not bring along with them. Urgently seeking for people to adopt or foster them.